Sanchez’s first Premier League goal – an instinctive diving header – put the hosts ahead in the 33rd minute to hand Spurs the initiative. Jamie Vardy came off the bench in the second half and saw his penalty saved by Hugo Lloris with his first touch (60), shortly before Eriksen put the hosts 2-0 up from outside the box in the 63rd minute. Vardy did pull a goal back for Claude Puel’s side in the 76th minute as he met Ricardo Pereira’s goalmouth cross, but Son sealed the victory in injury time (90+1) after capitalising on a Wilfred Ndidi slip to keep Mauricio Pochettino’s side within reach of the Premier League’s top two. Tottenham: Lloris (8), Trippier (6), Rose (6), Vertonghen (5), Sanchez (7), Winks (6), Sissoko (6), Skipp (6), Eriksen (8), Son (7), Llorente (6). Leicester: Schmeichel (6), Chilwell (6), Evans (5), Maguire (5), Pereira (6), Tielemans (6), Ndidi (5), Barnes (4), Ghezzal (5), Maddison (5), Gray (5). The result means Tottenham go nine points clear of fourth-placed Manchester United on 60 points. Leicester, meanwhile, remain in 12th on 32 points. Harry Maguire fired the first warning shot in the eighth minute when he escaped his marker, Fernando Llorente, to get his header on goal which forced Lloris to tip over the bar. Just a minute later, Harvey Barnes dragged an effort wide of the French goalkeeper’s left post. In the 16th minute, Son was booked in controversial circumstances after going down in the box under a Maguire challenge and Leicester continued to grow in confidence as Rachid Ghezzal went close with a curled left-footed strike in the 28th minute. Barnes was afforded another opportunity just after the half-hour mark, but the 21-year-old could not produce a clean shot on target. Barnes was made to rue his chance as Sanchez opened the scoring in the 33rd minute. Kieran Trippier’s corner, played short to Eriksen, was swung towards the Colombia international, who dived in to open his Tottenham account in the Premier League. Five minutes into the second half and Demarai Gray squandered a good opportunity to level for the visitors as he met Pereira’s cross with a tame free header, from inside the box, which was comfortably caught by Lloris. There was high drama on the hour mark when Vardy came off the bench and took Leicester’s penalty seconds after Jan Vertonghen tripped James Maddison up in the box. He elected to strike it to Lloris’ right, but the France World Cup winner read the spot-kick and parried it away. Tottenham responded quickly through Eriksen, who fired a dipping strike which got the better of Kasper Schmeichel from the edge of the box, but Vardy did bring Leicester back into the game with a simple tap-in 13 minutes later. 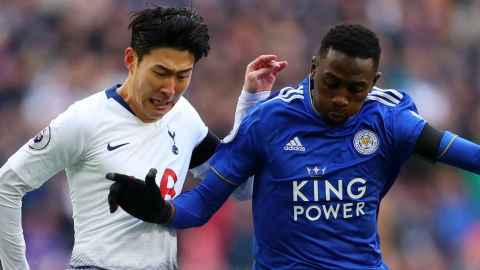 In injury time, with Leicester pushing players forward, Son sealed the win for Tottenham with an incisive finish from a quick counter-attack for his 11th goal in his last 13 appearances. Mauricio Pochettino: “I feel very proud. I think it was a fantastic result. “It was a tough game and Leicester played so well. You always have to fight to the end for big things. Claude Puel: “It’s disappointing and again we are left with not a good feeling. We should’ve had the game between our hands with a lot of chances. “We created a lot of good moves with a lot of good intentions and we didn’t find good finishing. We had all the opportunities to win this game but we couldn’t finish. Eriksen produced a typically classy display against Leicester and was rewarded for his efforts with a goal and assist. His pinpoint cross helped Sanchez to his first Tottenham goal in the Premier League, while the Denmark international’s goal in the second half proved to be decisive as he showed off his superior technique with a swerving strike. Tottenham take on Borussia Dortmund in the Champions League round-of-16 first leg at Wembley on Wednesday night. Leicester, meanwhile, host Crystal Palace at 5.30pm on Saturday evening in the Premier League.